NEW YORK - When I signed up to go to this Starling-DeLay Symposium on Violin Studies at Juilliard, I didn't know much about Brian Lewis, other than that people enjoy his teaching and that he recently made a CD with Michael McLean's new violin concerto and the Bernstein Serenade. I didn't know he is noted Suzuki teacher Alice Joy Lewis's son, or that he had actually travelled to Japan as a child and studied with Shinichi Suzuki himself. Nor so, so much more, if you read his impressive bio. 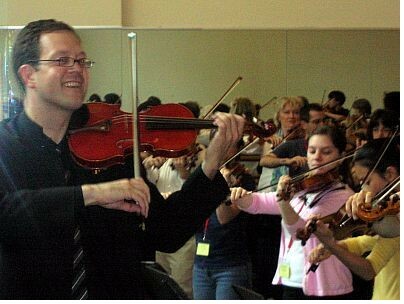 But I found that he certainly has a way of enjoying the violin, and sneaking technical work into the lesson by making it seem like a fun game. It suddenly made sense: he is the happy, grown-up Suzuki kid! On Friday, Lewis taught about expression and bravura, using Fritz Kreisler's "Gitana." Everyone had to dust off the violins that had been sitting at our sides during lessons and master classes, and play some real stuff. We started by listening to an Oscar Shumsky recording of the piece, then we did what I always do when I take out my violin: we played a Galamian acceleration scale. He pointed out that in the "Allegro guisto e ritmico": "We don't want to accent all the time or we will sound like William Shatner...."
Lewis encouraged everyone to "BREATHE! Get that oxygen in your blood!" The piece had a number of dotted notes, and Lewis gave us a new definition of a dotted note: "A dot means 'not legato.' That's all a dot means. This definition gives you freedom to think, how long could that dot be?" "In character pieces we can change the length of the dot; we have a lot of freedom," Lewis said. In working with this idea, "we want to do most of our experimenting in the practice room." He also encouraged the idea of having some fun with the piece: "Is there a place where we can have... eyebrows?" "Now don't go home and choreograph this with your students," he said, laughing, "it's the feeling of it. Have fun!" "There's nothing wrong with having dessert," Lewis said. "Dorothy DeLay used to talk about programming as if it were a menu." A good meal might have an appetizer, some meat and potatoes, "maybe one weird dish, like chicken hearts," he said, "and dessert, like a cake or bon-bons." Lewis said that he was looking at DeLay's comments, from when he played the piece for her in college. "Apparently I was sliding between each and every finger," he said. Instead of this approach, one has to to decide where to have shifts and slides. DeLay said of shifting, "overshifting is like going 90 mph into your garage. If we overshift, what happens to our garage?" Lewis said. I liked the way Lewis described the piece's "Allegretto grazioso," and you just have to hear it for this to make sense, but over the music he said, "Hi, I'm Brian, welcome to the supper club, welcome to my restaurant..."
Also, he said that for lift bows, to play "as if we are setting a bird free. We aren't throwing him -- no throwing the bird or kicking the cat, let's just release him!" Ah, fun. It can be fun! I don't know about the 90 mph garage metaphor, but I do like the bird metaphor. I can feel the tension releasing just by reading it. Some of my students are attending the camp in Ottawa, KS starting next Wednesday, and are lucky enough to have the opportunity to work with Mr. Lewis. Exciting! Thanks again, Laurie! Alena Baeva wins Sendai violin competition! Complete video of performances available at Sendai website. Thanks for posting! I especially enjoyed since I am looking at Mr. Lewis as a college instructor. Thanks Laurie--these are some of the only insights other than my basic work I'm getting at the moment, and your attention to details is much appreciated. Haha! I can't believe you mentioned my teacher... and my other teacher (I have Brian this summer). Anyway, you're getting me excited for camp now and I've really been enjoying your entries! Haha, that's classic Brian Lewis! He puts so much enthusiasm and fun into his teaching. I am also going to the camp in Ottawa mentioned above - can't wait to study with him again! Laurie, I'd be interested in hearing a more detailed description of how to do that Ysaye string crossing exercise. (i.e. describe, and how to apply it to a passage). That is, after you've gotten some rest after your most excellent adventure! It's just for getting better string crossings, practicing getting the elbow at each level. It ends up being a G major scale, with an A and B stuck on the end.